This distinctive and highly flexible programme provides great scope for you to customise your degree according to your interests. With a broad focus on cultural studies and sociolinguistics, the programme allows you to explore topics ranging from film to history, from gender to translation studies. Central to the degree is the study of two languages, with the possibility of changing language after the first year. Foreign language required to include the following if studied as the main language: French or Spanish grade A. A score of 17 points in three higher level subjects, with no score lower than 5. Higher level subjects to include the following if studied as main languages: French or Spanish at grade 6. A score of 16 points in three higher level subjects, with no score lower than 5. Higher level subjects to include the following if studied as main languages: French or Spanish at grade 6. Pass in Access to HE Diploma, with a minimum of 18 credits awarded with Distinction in the Level 3 units, the remainder of the Level 3 units awarded with Merit. D3,D3,M1 in three Cambridge Pre-U Principal Subjects. Foreign Language required, to include the following if studied as the main language: French or Spanish grade D3. Advanced Highers at grades A,A,B or Advanced Highers grades A,A plus Highers at grades B,B,B. Foreign language required to include the following if studied as the main language: French or Spanish grade A at Advanced Higher. Successful completion of the WBQ Advanced Skills Challenge Certificate plus 2 GCE A-Levels at grades AAB. Foreign language required to include the following if studied as the main language: French or Spanish grade A. You will be able to choose from the exceptional range of languages taught at UCL, including many of the less frequently spoken languages of Europe and beyond. You will spend a year abroad in a country where your main language is spoken. Language learning takes place in small groups with research-active teachers, many of whom are native speakers. Your learning will be well supported by the excellent facilities of the UCL Centre for Languages & International Education (CLIE). You will benefit from the outstanding specialist library resources and the enormous range of cultural experiences — such as exhibitions, film festivals, and concerts — that London has to offer. Year one mainly comprises core language and culture modules, providing a foundation for further study. You will also choose a main and a second language. In years one and two and in your final year you also choose optional modules from a wide range offered by both your chosen language departments and the School of European Languages, Culture & Society focusing on film, history, literature and linguistics. You will spend your third year abroad on an academic placement in a country where your main language is spoken. In your final year at UCL you will continue with your language studies either in both your languages, or concentrate on your main language only. You will select cultural modules in fields of your choice. Ancient Greek (may only be studied as a minor language); Arabic (may only be studied as a minor language); Bulgarian; Croatian; Czech; Danish; Dutch; Finnish; French (beginner's French may only be studied as a minor language); German; Hebrew; Hungarian; Icelandic; Italian; Japanese (may only be studied as a minor language); Latin (may only be studied as a minor language); Mandarin (may only be studied as a minor language); Norwegian; Polish; Portuguese; Romanian; Russian; Serbian; Spanish (beginner's Spanish may only be studied as a minor language); Slovak; Swedish; Ukrainian. Some language courses including Arabic, Mandarin, Japanese and beginner's French and Spanish are taught in the Centre for Langagues and International Education (CLIE) and may be subject to availability. Areas of cultural study offered include: history; film studies; linguistics; literary studies; translation. This degree allows great flexibility especially in your final year. You can continue studying your languages and follow language-specific content modules; take content modules within one of your departments or SELCS; drop your second language in your final year to pursue a greater number of content modules; or apply to outside options. In the past students have been allowed to take modules in anthropology, history of art, history and journalism in other departments and London institutions. Approval for outside options is granted on a case-by-case basis and with permission by the relevant provider. Securing a place on an outside course is the responsibility of the student. You will study modules in both your main language and a second language. You will also study the Language, Culture and Representation core module. You will select a cultural or linguistic module from your relevant main language department. You will also choose from a range of Interdepartmental First Level modules offered by SELCS. Options may include the study of literature, linguistics, film or history. You will study modules in both your main language and a second language (with the possibility of changing your main and second language, subject to approval). 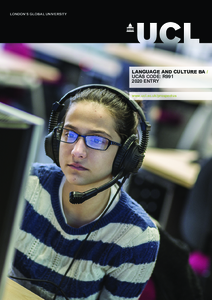 One outside option or cultural or linguistic module in your minor language department. You will spend your Year Abroad at a university in the country where your main target language is spoken, studying alongside native speakers, to make the most of your cultural and linguistic immersion. British Council language assistantships are available subject to approval. The experiences and skills developed while abroad further academic and personal development, cultural and social awareness, provide a foundation for further study and enhance career prospects. For further information please visit the SELCS Year Abroad website. Students taking Ancient Greek or Latin as a major language normally spend their year abroad in the country of their minor languages but while overseas must study Ancient Greek or Latin. You will study modules in your main language (and second language, where possible). This programme and the first-year core module are run by the Language and Culture BA Programme Tutor. Languages are taught intensively, and you will be trained in speaking, reading, writing and translating in your target languages. Students on this programme develop their skills in both languages and interdisciplinary and cultural studies. Language modules are normally assessed by coursework and written and oral examinations. Other modules are normally assessed through a combination of written coursework and examinations. Detailed course descriptions are available on the department website: Language and Culture BA. On graduation from this programme you can expect to have excellent oral and written language skills and breadth and depth of cultural knowledge. This degree cultivates numerous transferable skills, including the ability to organise your time and work independently, think critically, and analyse and present information. Graduates from the Language and Culture BA and related programmes have entered a wide range of professions including: journalism, the civil service, interpreting and translating, publishing, advertising, teaching, the media and the arts. A demand exists for graduates proficient in several languages, especially in the less commonly taught European languages. In assessing your application we are looking for evidence of your interest in and aptitude for language learning, as well as your interest in literature, film, art and other cultural subjects. If you know your language choices, please enter this in the relevant boxes on your UCAS Form. If your application demonstrates that your academic ability and motivation make you well-suited to our degree and you receive an offer, then we shall invite you to a Post Offer Open Day where you can experience the sort of teaching we offer and life in SELCS. Our admissions process aims to assess your linguistic abilities and attainments as well as cultural awareness and intellectual potential. We may interview candidates by telephone in order to establish a level of language ability.